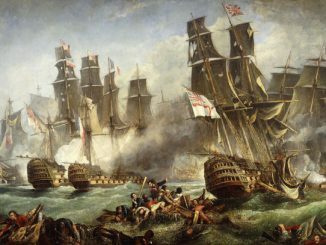 This first-person account of the Battle of Trafalgar comes to us from Lieutenant Paul Harris Nicholas, Royal Marines, who was serving aboard the HMS Belleisle at the time. It was given aboard the HMS Bijou in 1829. 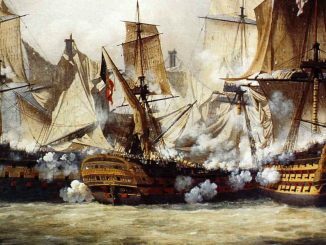 I was scarcely sixteen when I embarked for the first time, in the Belleisle of eighty guns, and joined the fleet off Cadiz, under the command of Lord Nelson, in the early part of October, 1805. On the 19th of that month the appearance of a ship under a press of sail steering for the fleet and firing guns, excited our attention, and every glass was pointed towards the stranger in anticipation of the intelligence which the repeating ships soon announced “That the enemy was getting under way.” The signal was instantly made for a general chase, and in a few minutes all sail was set by the delighted crew. Our advanced ships got sight of the combined fleet the next morning, and in the afternoon of the 20th they were visible from the deck. Every preparation was made for battle; and as our look-out squadron remained close to them during the night, the mind was kept in continual agitation by the firing of guns and rockets. As the day dawned the horizon appeared covered with ships. The whole force of the enemy was discovered standing to the southward, distant about nine miles, between us and the coast near Trafalgar. I was awakened by the cheers of the crew and by their rushing up the hatchways to get a glimpse of the hostile fleet. The delight manifested exceeded anything I ever witnessed, surpassing even those gratulations when our native cliffs are descried after a long period of distant service. There was a light air from the north-west with a heavy swell. The signal to bear up and make all sail and to form the order of sailing in two divisions was thrown out. The Victory, Lord Nelson’s ship, leading the weather line, and the Royal Sovereign, bearing the flag of Admiral Collingwood, the second in command, the lee line. At eight the enemy wore to the northward, and owing to the light wind, which prevailed during the day, they were prevented from forming with any precision, and presented the appearance of a double line convexing to leeward. At nine we were about six miles from them, with studdingsails set on both sides; and as our progress never exceeded a mile and a half an hour, we continued all the canvas we could spread until we gained our position alongside our opponent. 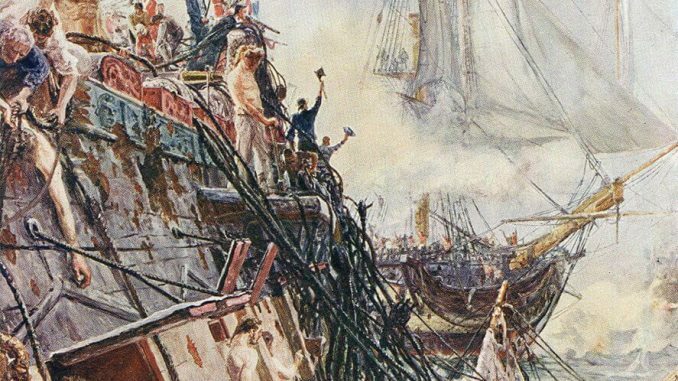 At half-past ten the Victory telegraphed “England expects every man will do his duty.” As this emphatic injunction was communicated through the decks, it was received with enthusiastic cheers, and each bosom glowed with ardour at this appeal to individual valour. About half-past eleven the Royal Sovereign fired three guns, which had the intended effect of inducing the enemy to hoist their colours, and showed us the tricoloured flag intermixed with that of Spain. The drum now repeated the summons, and the Captain sent for the officers commanding at their several quarters. “Gentlemen,” said he, “I have only to say that I shall pass close under the stern of that ship; put in two round shot and then a grape, and give her that. Now go to your quarters, and mind not to fire until each gun will bear with effect.” With this laconic instruction the gallant little man posted himself on the slide of the foremost carronade on the starboard side of the quarterdeck…. The determined and resolute countenance of the weather-beaten sailor, here and there brightened by a smile of exultation, was well suited to the terrific appearance which they exhibited. Some were stripped to the waist; some had bared their necks and arms; others had tied a handkerchief round their heads; and all seemed eagerly to await the order to engage. My two brother officers and myself were stationed, with about thirty men at small arms, on the poop, on the front of which I was now standing. The shot began to pass over us and gave us an intimation of what we should in a few minutes undergo. An awful silence prevailed in the ship, only interrupted by the commanding voice of Captain Hargood, “Steady! starboard a little! steady so!” echoed by the Master directing the quartermasters at the wheel. A shriek soon followed – a cry of agony was produced by the next shot – and the loss of the head of a poor recruit was the effect of the succeeding, and as we advanced, destruction rapidly increased. A severe contusion on the breast now prostrated our Captain, but he soon resumed his station. Those only who have been in a similar situation to the one I am attempting to describe can have a correct idea of such a scene. My eyes were horrorstruck at the bloody corpses around me, and my ears rang with the shrieks of the wounded and the moans of the dying. At this moment, seeing that almost every one was lying down, I was half disposed to follow the example and several times stooped for the purpose, but – and I remember the impression well – a certain monitor seemed to whisper, “Stand up and do not shrink from your duty.” Turning round, my much esteemed and gallant senior fixed my attention; the serenity of his countenance and the composure with which he paced the deck, drove more than half my terrors away; and joining him I became somewhat infused with his spirit, which cheered me on to act the part it became me. My experience is an instance of how much depends on the example of those in command when exposed to the fire of the enemy, more particularly in the trying situation in which we were placed for nearly thirty minutes from not having the power to retaliate. It was just twelve o’clock when we reached their line. Our energies became roused, and the mind diverted from its appalling condition, by the order of “Stand to your guns!” which, as they successively came to bear were discharged into our opponents on either side; but as we passed close under the stern of Santa Ana, of 112 guns, our attention was more strictly called to that ship. Although until that moment we had not fired a shot, our sails and rigging bore evident proofs of the manner in which we had been treated; our mizzentopmast was shot away and the ensign had been thrice rehoisted; numbers lay dead upon the decks, and eleven wounded were already in the surgeon’s care. The firing was now tremendous, and at intervals the dispersion of the smoke gave us a sight of the colours of our adversaries. 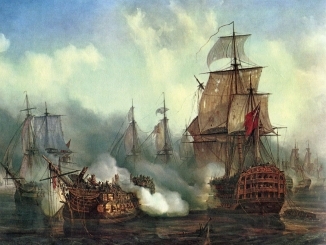 At this critical period, while steering for the stern of L’Indomptable (our masts and yards and sails hanging in the utmost confusion over our heads), which continued a most galling raking fire upon us, the Fougeux being on our starboard quarter, and the Spanish San Juste on our larboard bow, the Master earnestly addressed the Captain. “Shall we go through, sir?” “Go through by _____” was his energetic reply. “There’s your ship, sir, place me close alongside of her.” Our opponent defeated this manoeuvre by bearing away in a parallel course with us within pistol shot. About one o’clock the Fougeux ran us on board the starboard side; and we continued thus engaging until the latter dropped astern. Our mizzenmast soon went, and soon afterwards the maintopmast. A two decked ship, the Neptune, 80, then took a position on our bow, and a 74, the Achille, on our quarter. At two o’clock the mainmast fell over the larboard side. I was at the time under the break of the poop aiding in running a carronade, when a cry of “Stand clear there! here it comes!” made me look up, and at that instant the mainmast fell over the bulwarks just above me. This ponderous mass made the ship’s whole frame shake, and had it taken a central direction it would have gone through the poop and added many to our list of sufferers. At half-past two our foremast was shot away close to the deck. In this unmanageable state we were but seldom capable of annoying our antagonists, while they had the power of choosing their distance, and every shot from them did considerable execution. We had suffered severely as must be supposed; and those on the poopwere now ordered to assist at the quarter deck guns, where we continued till the action ceased. Until half-past three we remained in this harassing situation. The only means at all in our power of bringing our battery towards the enemy, was to use the sweeps out of the gunroom ports; to these we had recourse, but without effect, for even in ships under perfect command they prove almost useless, and we lay a mere hulk covered in wreck and rolling in the swell. At this hour a three-decked ship was seen apparently steering towards us; it can easily be imagined with what anxiety every eye turned towards this formidable object, which would either relieve us from our unwelcome neighbours or render our situation desperate. We had scarcely seen the British colours since one o’clock, and it is impossible to express our emotion as the alteration of the stranger’s course displayed the white ensign to our sight. We did not, however, continue much longer in this dilemma, for soon the Swiftsure came nobly to our relief. Everyone eagerly looked towards our approaching friend, who came speedily on, and when within hail manned the rigging, cheered, and then boldly steered for the ship which had so long annoyed us. Shortly after the Polyphemus took off the fire from the Neptune on our bow. It was near four o’clock when we ceased firing, but the action continued in the body of the fleet about two miles to windward…. About five o’clock the officers assembled in the captain’s cabin to take some refreshment. The parching effects of the smoke made this a welcome summons, although some of us had been fortunate in relieving our thirst by plundering the captain’s grapes which hung round his cabin; still four hours’ exertion of body with the energies incessantly employed, occasioned a lassitude, both corporeally and mentally, from which the victorious termination now so near at hand, could not arouse us; moreover there sat a melancholy on the brows of some who mourned the messmates who had shared their perils and their vicissitudes for many years. Then the merits of the departed heroes were repeated with a sigh, but their errors sunk with them into the deep.